Part historical novel, part family drama, part supernatural thriller, Paula Brackston's debut novel strives to be taken seriously. To a large degree, it succeeds. Most novels involving witches and warlocks are genre exercises, ranging from Robin Hobb and Melanie Rawn to Brian Froud and Harry Potter. Most serious, "literary" novels eschew elements like magic, fairies, immortality or yes, witches. For whatever reasons of aesthetics or literary history (and notwithstanding notable exceptions such as A Midsummer Night's Dream), the conventions of fantasy have become roped off into their own separate genre—some would say ghetto. Despite the resurgence of serious fiction with fantastic elements—think of The Time Traveler's Wife or The Girl With Glass Feet, not to mention Salman Rushdie's elaborate confections—there is little that screams "genre!" quite so loudly as witches. Well okay, maybe vampires do, but not much else. The Witch's Daughter tries to undermine all that. It's about a witch, all right, but it also attempts to tell a serious story, on multiple levels, across disparate ages and utilizing some powerful historical motifs. Part historical novel, part family drama, part supernatural thriller, Paula Brackston's debut novel strives to be taken seriously. To a large degree, it succeeds. Here's the story. Young Bess is the daughter of a local healer in 1600s Britain. Following a bout of plague that carries off much of the town but leaves Bess unscathed, the family encounters trouble from the local community, which is suspicious of Bess's survival. 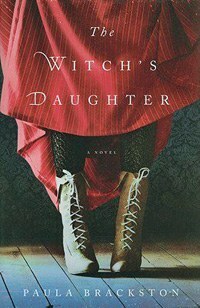 Never mind that much of Bess's own family has died, as well—in the aura of superstitious frenzy following the plague, the mother is accused of witchcraft. This is a charge that Bess rejects, of course, until she figures out that maybe she shouldn't bother. Her mother entrusts Bess into the all-too-willing arms of one Gideon Masters, a local mystery man who seems to know a few things that no one else does and who holds a powerful love-hate appeal over Bess herself. Gideon, it turns out, was instrumental in Bess's surviving the plague, and now he wants compensation. His pursuit of her across the centuries provides the through-line of the story. There's much more going on, though. In present-day Britain, a woman named Elizabeth settles into a new rural life and begins looking after a kitchen garden. With the herbs she grows there, along with other material gathered from the woods nearby, she launches her business of natural remedies—some of which seem far more effective than any simple concoction of herbs and beeswax ought to be. Elizabeth soon encounters a local teenager named Tegan, an untethered young woman who is painfully in need of some maternal attention. Against her better judgment, Elizabeth provides this, along with instruction about how to concoct those herbal remedies. Interspersed with the modern-day tale are other episodes tracing the life of Bess/Elizabeth, including a bloody late-Victorian mystery and the gruesome trenches of World War I. It's no secret that Bess has gained virtual immortality thanks to her mother, and so experiences these events firsthand. What is unexpected is how these strands intertwine with Bess's earlier life. At least, it's unexpected at first. One problem with the story is that there is a recurring surprise that, by the time we reach World War I, isn’t much of a surprise anymore. In fact, the reader is apt to figure out the puzzle well before Elizabeth does, which does little to reinforce the reader's sense that the narrator is particularly on the ball. After several centuries of wrestling with this particular mystery, it would be logical to expect the narrator to be more alert for it, but alas no. This is a relatively minor shortcoming, though. Much of the novel is engaging and well-drawn, in particular the historical set pieces, which effectively convey situation through the use of careful detail. "Eliza peered down at the figure. In the low gaslight, his features were softened… The noose that had dispatched him to another place had burned a vivid line around his neck." Behind the battle lines of the First World War, "The evacuation tent prepared patients for the longed-for trip home or return to the front. The resuscitation tent was a limbo. A purgatory. Here it was that men too weak to withstand surgery, however much they needed it, must cling to life and wait for an improvement in their conditions that frequently did not come." It must be said, though, that there are moments of melodrama, of overwrought emoting that harken back to those genre novels that this book is trying so hard not to be: "There is a dark energy that surrounds the battlefield, that feeds off the violence and cruelty of war. It is a frightening force. A potent one." You can almost hear Dumbledore intoning the words. Perhaps most egregious are those rapidfire, one- or two-word sentences that are the stock in trade of writers who are trying to make something wildly suspenseful when it is, in fact, only moderately suspenseful. "It was a face from a nightmare. A demon. A monster." Ultimately, the narration slips into that sort of style relatively rarely, while managing to be a compelling read more often than not. At heart, though, it's still a book about a witch, and there are fairies and warlocks and dark forces aplenty at work in these pages. The juxtaposition of these elements with more mundane ones makes an diverting story, but not quite a riveting one.